We invested in two paid tours while in Rome, and I think it was money and time well spent. All my adult traveling life I have shied away from organized tours, but in the months leading up to this vacation my head was starting to explode from the effort of cramming adequate background information in, so I decided to let someone else do at least a little of the heavy lifting. How do you find a walking tour of an busy ancient/modern city that is wheelchair-friendly? I gleaned the names of a number of tour companies from website reviews, guidebooks and my own googling. I was attracted to Context Travel initially for a number of reasons; the groups are small (6 people) and how can you not love a corporate description that includes the words “didactic” and “erudite”? Context was also the only company that actually had the word “wheelchair” appear anywhere on their website without the word “no” somewhere in its immediate vicinity. A slight digression: use Google’s site search to find a particular word or phrase on a given website. This is great when the website’s own navigation isn’t going to cut it. Plug the phrase “wheelchair site:contexttravel.com” into Google, and you get Context’s Rome Frequently Asked Questions, which includes the faint suggestion that wheelchair touring of Rome is a possibility. Thank you for your inquiry with Context. In terms of the Vatican, we unfortunately cannot have wheelchair users on the small group walks because the Vatican requires people with wheelchairs to take a completely different route through the museums, which bypasses many of the galleries we cover on the small group walk. It is this difference in route that requires us to have wheelchair users book the walk privately, though we do provide a discount in these cases as there is no option of the private walk. For the other walks, I would strongly warn against the Roma Antica. There is no paving on either the Palatine Hill or the Forum, which makes it nearly impossible to bring the wheelchair into these areas. We attempted this several years ago and unfortunately the site is made so unfriendly in terms of accessibility that it was near impossible. 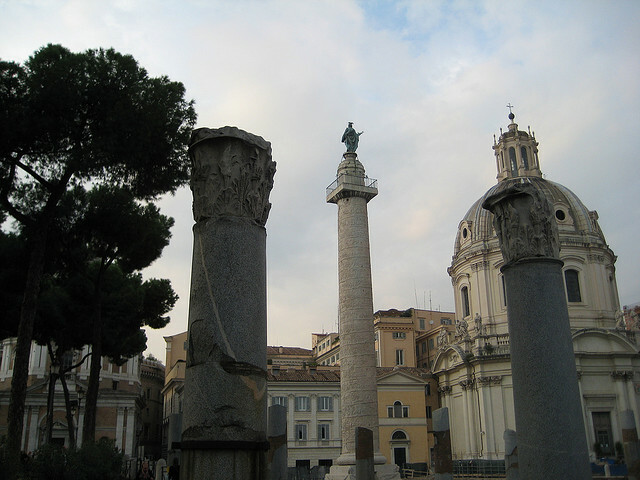 Therefore, I would recommend the Imperial Rome walk, which covers the Colosseum and the Trajan’s Markets. There is quite a bit of distance to wheel in between the sites, but I will leave that to your discretion as far as what you feel you will be able to handle. Both the Colosseum and the Trajan’s Markets are wheelchair accessible with ramps and elevators, so getting inside the sites should not be a problem. All told, the distance between the sites is about 1.2 miles. If you want to check out the route on a map, we begin at the entrance to the Palatine Hill (via di San Gregorio 30) and often end inside the Trajan’s Markets (though sometimes we just view it from the outside if time is short), which is on via IV Novembre. In terms of the Classical Rome, the only restriction you might find would be that some of the docents visit the underground areas of San Nicola in Carcere, which are not accessible. However, not all of the docents do this and so I’m sure they would just modify the route. Otherwise the restrictions here might come from distance, which is about 1 mile (from Piazza Bocca della Verita to the Pantheon) over areas of the city that are often just cobblestones. Based on this and on our belief that we could adequately tour the Colosseum by ourselves, we chose Classical Rome, and were very pleased. Our docent was Saskia Stevens, an Oxford PhD student in archeology. Her love for the subject matter was evident, and she placed what we were seeing in splendid historical context. Her description of what we were seeing in the Roman Fora was especially cogent and enlightening. The other two couples on our tour were fresh off the boat/airplane and were pretty jetlagged/exhausted – one couple dropped out about halfway through. Saskia also gave me one of the Italian phrases I used the most often in restaurants: servietta bagnata (ie, a wet napkin to clean off my grimy wheelchair pushing hands before eating). She also showed us the other wheelchair route up Monte Capitolino. I was bemoaning Context’s unwillingness to have me on the Vatican Museum tour to a friend, and he recommended Laura Weinstein. Laura has been living in Rome for 4 years. In her previous life, she produced documentaries for the National Geographic, Discovery Channel, PBS and others, and is now working on a project about Caravaggio (sad to say, we only saw 2 Caravaggios the whole time we were in Italy!). She was game to try a wheelchair tour of the Vatican Museums, so off we went. This was one of the few places where I paid full price admission as a wheelchair user. Mary Hanson, in her very useful series articles on accessible Rome, says that discounted admission is available. We asked about this, and were told that I needed an card from the commune (sounds like the German museums wanting my Behindertenausweiss [official disability identification]), so we didn’t try to argue. We met in front of Saint Peter’s at about two in the afternoon (Laura told us the afternoon would be less crowded, and it was) and walked around the walls of Vatican City while Laura gave us some introductory information. Once inside and paid, we admired the reproduction of Laocoön in the entry as we were not going to be able to see the original (I’m still mourning the inaccessibility of the Pio-Clementine Museum, which includes the Laocoön and the Apollo Belvedere). Laura provided a very nice précis of the history of early Christianity and its relationship to Rome, after which we whipped through the Pinacoteca, followed by (not necessarily in this order, because I’ve forgotten) the Gallery of Tapestries, the Gallery of Maps, the Candelabra Gallery (which I studied in great detail while Laura and my husband were in the inaccessible Etruscan Museum), and the Raphael Rooms (ah! The School of Athens!). Laura oriented us to the Sistine Chapel frescoes using the display boards provided in the Pinecone Courtyard. Access to the Sistine chapel was via platform lift (being repaired as we appeared, which was accomplished fairly quickly) and extremely steep Ramp of Death (do not try this on your own!). Then we dashed out of the museum complex in order to walk all the way around the walls of Vatican City again in order to get to St. Peter’s Basilica before it closed at 7:00 pm. (Note that there is a direct route between the Sistine Chapel and the Basilica, but it involves stairs, so as a “strict wheelchair user” [Laura’s apt phrase], we went around.) We had about twenty minutes in St. Peter’s before we were shooed out. The tour was an intense overview of an incredible amount of material, and it was great to have Laura’s guidance.